BEIJING: The first China-Pakistan foreign minister-level strategic dialogue will be held on Tuesday in Beijing, Chinese foreign ministry spokesperson Geng Shuang said on Monday. 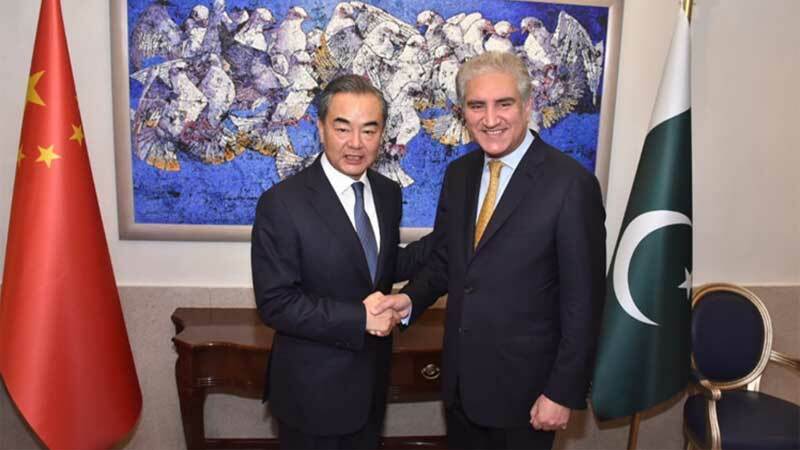 “The strategic dialogue will be co-chaired by Pakistani Foreign Minister Shah Mahmood Qureshi and China’s State Councilor and Foreign Minister Wang Yi,” he said during a routine press briefing. Giving the details, the spokesperson said the two sides will exchange views on China-Pakistan relations and international and regional issues of common concern. He pointed out that India-Pakistan relations and regional situation recently remained very tense and hoped that the two sides will touch this issue as well in the dialogue. “What I want to say here is that as a friendly neighbour of India and Pakistan, China actively promotes peace and promotes talks and has played a constructive role in easing tensions in future,” he said. “The Chinese side will continue to encourage India and Pakistan to move in the same direction, resolve differences through dialogue and jointly safeguard regional peace and stability,” he added. While commenting on the first meeting between officials of India and Pakistan to discuss Kartarpur corridor, he welcomed the latest interaction between the two countries and hoped that the progress will help further normalize India-Pakistan relations and the regional situation. “India and Pakistan are neighbours who cannot geographically change the place. It is in fundamental interest of both the sides that they live in harmony with each other … this is also a common expectation of the international community,” he added. The spokesperson also hoped that the two sides will continue to demonstrate goodwill and move in the right direction to resolve differences through dialogue, improve relations and jointly safeguard regional peace and stability. Responding to a question, he said he cannot predict which specific issues will be discussed in the strategic dialogue between the foreign ministers of China and Pakistan. “But as I said earlier, the dialogue will definitely involve China-Pakistan bilateral relations and international and regional issues of common concern,” he added. To a question about the issue of listing of Jaish-e-Mohammad chief Azhar Masood, he said the position of the Chinese side is already very clear “and I will not repeat it here.” He emphasized that China will continue to handle this matter in a constructive and responsible manner and maintain close communication with all the relevant parties, including India and Pakistan. Meanwhile, Shah Mahmood Qureshi addressed a large gathering of Chinese scholars and researchers at the China Institute for International Strategic Studies (CIISS) in Beijing. In his speech, the foreign minister said that the all-weather friendship between Pakistan and China is an anchor of regional peace and security. He also highlighted the recent developments in South Asia and Pakistan’s efforts to defuse the tensions. Referring to volatile strategic environment in the region, the foreign minister stressed the need for a meaningful dialogue between neighbouring countries to ensure regional peace and stability. Established in 1979 as a non-profit academic organization, the CIISS is one of the most prestigious think tanks in China due to its distinctive historical background, diversified multi-domain teams of experts, academic quality and policy influence. The foreign minister also held a meeting with the leadership of CIISS, led by Vice Chairman Maj Gen (r) Gong Xianfu.